At the North Berkeley restaurant, the fish is flown in from Japan and served with little adornment. 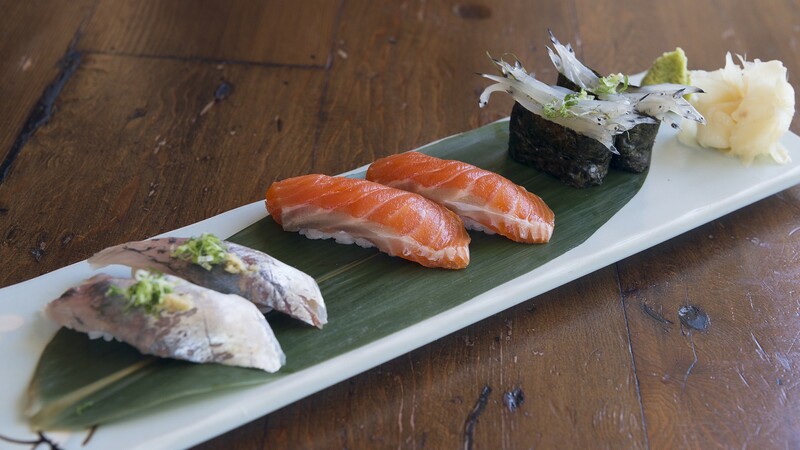 At Kamado's sushi bar, you'll find unusual seafood such as shirauo, tiny ice fish (right). Sushi devotees not only know their saba from their aji, but they also pay close attention to the people behind the sushi bar. It's common for folks to become loyal to specific sushi chefs as opposed to restaurants. 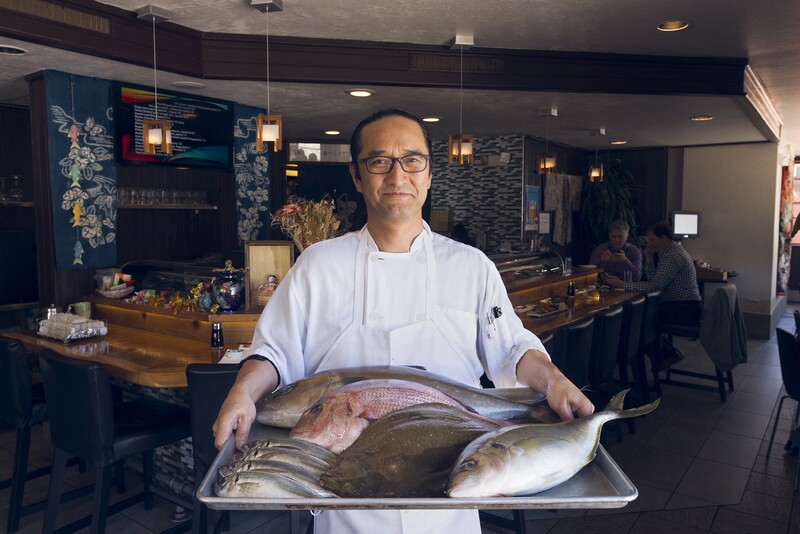 Such is the case with Jin Joo, who quickly cultivated a following at his North Berkeley restaurant Kamado Sushi after spending years working at other people's restaurants. Japan native Joo first moved to the United States in 1990 to study computer science at UC Berkeley. He landed his first job in Fremont, but he grew tired of staring at a screen every day and decided to pursue his love of cooking instead. He attended culinary school in South Korea — Joo is ethnically Korean and Japanese — and bounced around restaurants in Korea, Texas, and Vermont before returning to the Bay Area as a chef at Anzu inside the Nikko Hotel in San Francisco. Along the way, he trained under master sushi chefs and developed a fan base while at Coach Sushi in Oakland. But Joo didn't like making Americanized, giant sushi rolls covered in mayonnaise. "That is not the real sushi," he said. "I'm not that kind of sushi chef." It took years for Joo to save enough money to open his own place, but now, he gets to make the kind of sushi he loves: simple, traditional nigiri. Kamado opened without fanfare at the end of 2014. It's a small, minimalist space, with comfortable chairs and origami chopstick rests folded out of colorful, polka-dot paper. The lone television screen shows the day's seasonal fish specials. If you can't snag a seat at the sushi bar, be sure to snap a photo of the screen with your phone and make it the base for your meal. It's where you'll find the exciting, unusual specimens that you're unlikely to see at most local sushi bars. Recently, I enjoyed shako, mantis shrimp that's only available for a few weeks every year. Served alongside its large skeleton, the meat had a bright flavor with the buttery texture of lobster. I tried shirauo (ice fish), with maybe a dozen of the tiny fish piled into a ring of nori. Cold and crunchy, they had a faintly bitter finish reminiscent of grapefruit. And there was hotaru ika, two tiny firefly squids, perched atop rice, with a remarkably creamy and soft texture. Joo later explained that they glow blue at night — hence the English name — and live deep in the ocean, only emerging in the spring to spawn. You can learn such interesting tidbits if you dine omakase style, where you relinquish control to the sushi chef. Even on an unusually busy Tuesday night, when I snagged the last seat at the bar, Joo was an attentive host. He juggled large orders with preparing a coursed-out, 14-item parade of nigiri for me, constantly checking in with a quick nod and a smile, and explaining each piece of fish. Regardless of where you sit, the servers are sweet and speedy, and greet you with a steaming hot towel. Joo began my omakase meal with melt-in-your-mouth Bluefin tuna; sweet, plump scallops from Hokkaido; and ivory whelk, a chewy sea snail served next to its spiral shell and dark, creamy liver. Next came aji (horse mackerel), topped with scallions, ginger, and a thin sheet of marinated kelp that accented the powerful flavor; sagoshi (young Spanish mackerel), soft and sweet; and kinmedai (Golden Eye snapper), which Joo torched for a blast of smoke. Then, there was smooth Hamachi belly. Insanely lush and fatty ocean trout. O-toro, the prized Bluefin tuna belly, as pastel pink with fat as you'd hope. And finally, the orange crown of three tongues of uni, flown in from Hokkaido. Once you try Hokkaido sea urchin, it's hard to go back to the domestic stuff. Unlike some of the trendier, higher-end omakase spots in the Bay Area, Kamado keeps the flourishes to a minimum. Sometimes there's a bundle of sliced scallions, a brush of sauce, or a blow torch involved, but usually, Joo likes to leave the fish alone. It speaks to his philosophy as a sushi chef. When he eats sashimi, he adds a little wasabi and no soy sauce, preferring to taste the fish's full, unadulterated symphony. There's no reason to mask the flavor when Joo is so particular with his sourcing. On Tuesdays, Thursdays, and Fridays, he receives overnight orders directly from the famed Tsukiji Fish Market in Tokyo. He also gets fish flown overnight from Kyushu, the warmer, southern part of Japan. On a recent evening, there were 15 varieties of seafood on the specials board from Japan, joined by shrimp from Canada and Argentina. Jin Joo sources much of Kamado's seasonal fish from Tsukiji Fish Market. My only critique of Joo's nigiri is the rice. While well-seasoned and delicious, the texture can be a little tight. In order to thrive as a neighborhood restaurant, Joo does serve a wide variety of other Japanese dishes — and even some rolls! — and the ones I tried were all good, though certainly not the star attraction. Grilled, miso-glazed black cod feels like a staple at local Japanese restaurants these days, and Kamado's version delivers. Marinated for 40 hours in miso, mirin, and sake, the fish was cooked perfectly, with the subtlest whisper of truffle oil. The skinny Japanese eggplant, sliced open and slathered with miso, carried smoke from the grill. And the chawanmushi was excellent — a quivering, delicate egg custard slowly simmered with house-made dashi, mirin, shrimp, chicken, mushrooms, and fish cake. On my visits, I ignored the normal menu's sushi options and missed out on one intriguing offering that's on my order list for next time: battera sushi. The only other restaurant I'm aware of in the East Bay that serves it is Sushi Sho in El Cerrito, which speaks to the seriousness of the endeavor. At Kamado, Joo presses mackerel or salmon with white kelp and rice using a wooden box — it's a traditional, Osaka style of making sushi from the days before refrigerators and handmade nigiri. Hours: Tue.–Thu. 11:30 a.m.–2:30 p.m., 5 p.m.–9:30 p.m.; Fri. 11:30 a.m.–2:30 p.m., 5–10 p.m.; Sat. 4–10 p.m.; Sun. 4 p.m.–9:30 p.m.